Developed on the track, race proven and fitted to factory race bikes Translogic’s throttle blipper system features adaptive-shift-technology and multi-stage blip intensity, plus pro-tuner-mode for changing shift force and throttle blip durations at different engine RPMs. TESTED TO OVER 1,000,000 SHIFTS! Ultra-durable Quickshifter sensors, designed to perform, produced from Titanium and Stainless steel alloys. Environmentally endurance passed. The #1 OEM choice for reliability and performance. 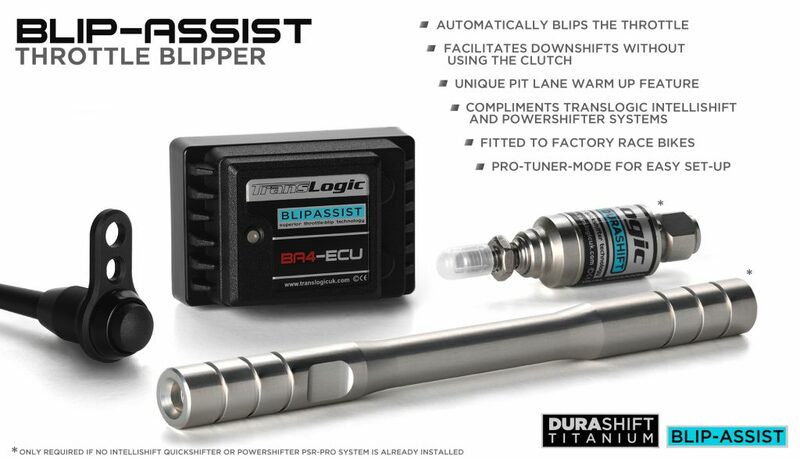 Dual channels for road or race shift set-up designed to perfectly compliment Translogic’s the Blip Assist ECUs. Tie-rods manufactured using aircraft specification aluminium for durability and lightness featuring Translogic’s DUAL THREADS. Supplied as a 2 piece tie-rod kit for an easy install. This new state-of-the-art Throttle Blipper system or Down Shifter is designed to compliment Translogic’s Intellishift DCS systems and Powershift systems. The Blip Assist ECU interfaces with the engines throttle body connectors via the plug&play connectors. During down shifts either Translogic’s DCS sensor or Powershifter ECU sends a signal to the Blip Assist ECU which then performs a controlled throttle blip depending on riding conditions at the time of the down shift. Fully adjustable and adaptive. The strength/duration of the throttle blip can be adjusted using Translogic’s Pro-Tuner-Mode (No PC is necessary). The sensor trigger force can be adjusted too as well as the intensity of the blip itself in 5 different RPM bands. There are default settings within the Blip Assist ECU thanks to the hundreds of hours of real world testing carried out by Translogic Systems and it’s professional partners giving you a great head start when first experiencing this new technology.